It’s Breast Cancer Awareness Month so what? In this month of October, you will see a lot of posts, fundraising initiatives and frankly a lot of noise being made about breast cancer awareness. I will be adding my voice to that. You might be thinking, you’ve heard enough already, after all there are many other forms of cancer as well as chronic illnesses. That’s true. My heart goes out to all who live with chronic illnesses and their loved ones. Let’s face it, when it comes to chronic ill-health, there are a lot of circumstances that are beyond your control. You then have to draw up your internal reserves of faith, hope and courage to keep going when life gets tough. I am however using this opportunity in October to talk about what each person can actually do; that is regular breast checks. This is not just for women only, men need to be breast aware too. To be honest, until 2015, I didn’t realise that men could have breast cancer. However, when I met a dear gentleman who was undergoing treatment at the time, I realised that promoting breast health isn’t just a female thing. There are only 370 men diagnosed with breast cancer in the UK per year compared to 1 in 8 women. That is more than 370 families affected – all the loved ones are impacted by breast cancer diagnosis. Breast cancer survival rates here in the UK are at the highest it has been for 40 years – more than 78% of all diagnosed survive at least 10 years afterwards. A lot of that is attributable to increased breast cancer awareness and breast health promotion. 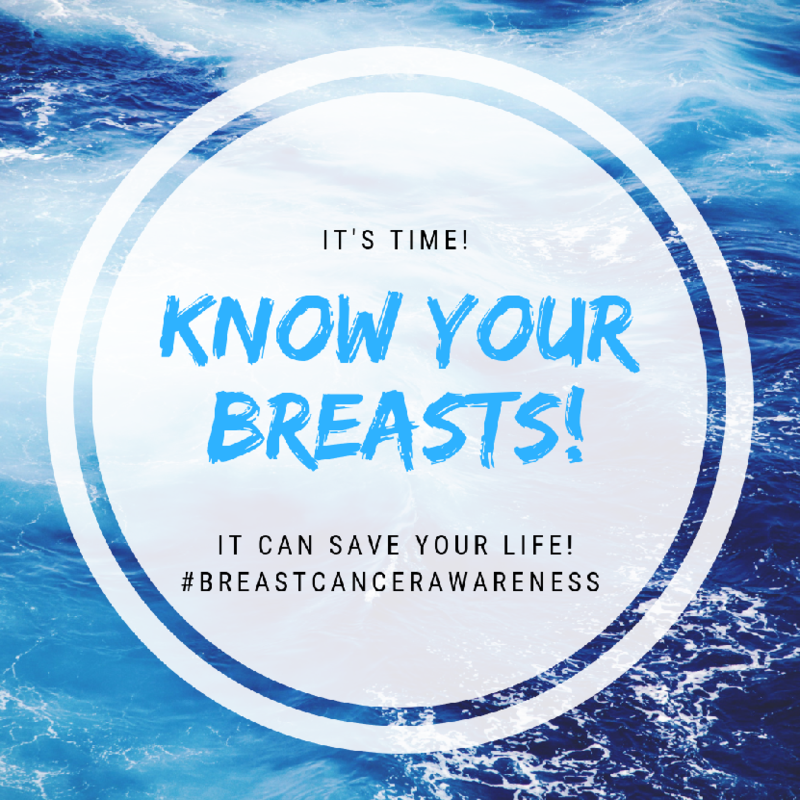 In spite of all the information out there, 1 in 3 women and 73% of men don’t check their breasts regularly. I want to address a couple of reasons why people don’t check their breasts regularly. 1. Fear – There are so many out there who don’t want to even contemplate the idea of anything being wrong with their breasts. They are frightened about what they might find if they check. This kind of fear is so well-hidden that it can go unacknowledged for years. This might be because they have seen the impact of breast cancer treatment on a friend or associate and they don’t want to be in those shoes. The truth of the matter is, being a breast cancer patient is not a club that anyone wants to belong to. I can attest to that from my own personal experience. However, that fear might end up killing you. If you don’t know what’s normal for you, there’s no way for you to tell what changes to report to your doctor. That can then lead to a late diagnosis which means poor long-term prognosis. 2. Apathy – There is an indifference or disinterest that can lull people into a false sense of security because none of their loved ones has ever been diagnosed with breast cancer. It is that view that makes them feel sorry for those affected in a distant way whilst thinking that they have nothing to worry about. This is a big issue where younger women are concerned. By this I mean women aged 39 and under. In the UK, only 4% of breast cancer diagnosis that is 2,200 women fall into this age group. I was part of this club that I didn’t choose when I was diagnosed at the age of 37. This is the stage in life in which a lot of use either have younger children or have to think about fertility issues. A late diagnosis doesn’t do any of your loved ones any favours. There are other reasons why people avoid checking their breasts. If you’re in that category, identify your mental stumbling block, deal with it and get checking. Behind the numbers and statistics, there are people from diverse backgrounds. Even with the progress in survival rates, 11,500 people in the UK die per year from breast cancer. That equals thousands of devastated families who will always carry the pain of loss. In 2017, my family was one of those. The pain of losing my big sister decades after losing my mother never goes away. It is part of me now. I wouldn’t wish that on anyone else. I was fortunate enough to be diagnosed early and that means my prognosis is a good one. Breast Cancer Awareness Month for me is not about the pink ribbon though I love how pretty it looks on my clothes. I want to get the breast health message across to as many as possible so that late diagnosis can be a thing of the past. That is why I volunteer for Breast Cancer Care, a UK-based support charity to promote breast health. October is just one month out of the whole year. Regular breast checks are for everyone all-year round.